It was when the King Nrupa Keshari ruled over ancient Odisha. Historians think that the years are 852–857. Karama, the old Marathi woman lived in one of Puri’s mutts. It had been a long time since she’d been there. She had come to Puri to search for her missing husband and look at Jagannatha, but hadn’t left. Here she had accepted the famed Indraswami as her guru. Every morning, Karama would wake up and offer something to Jagannatha at her home. One day, she decided to do something special. She would make Khichdi. And so she got a small earthen pot from the potter and the ingredients for the food. The next morning she woke up early and lit the fire. Khichdi would take time. 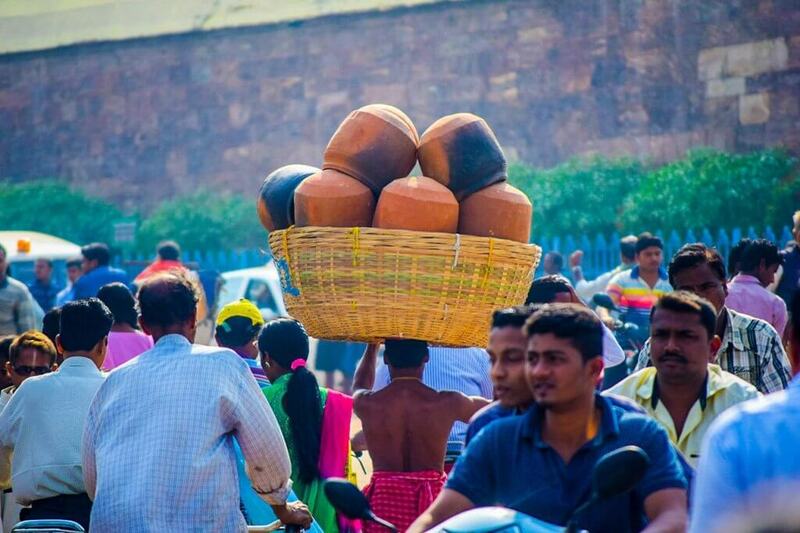 Man carries earthen pots for the Puri temple. When food is offered to Jagannatha in the sanctum sanctorum of the great temple of Puri, there are a number of rituals that have to be done. Hundreds of earthen pots filled with cooked prasada are stacked in front of the smiling deities. The chief priest then cups his palms together and looks into them. If he sees, for a split-second, the form of Jagannatha — then the food is saidd to be divinely approved. But this day he did not. Something was surely out of place. Perhaps a dog had entered the temple or someone had not been ritually ‘pure’ while cooking food for God. As always, Karama had gone for her daily visit to the temple. There she came to know about the situation and thinking that perhaps the deity wanted her Khichdi, asked the temple officials if she could offer it in the temple. The priests refused. One of them had seen Karama cook the food that morning. He had seen how she used the same twig to stir the mixture with which she brushed her teeth. Meanwhile, how can food from a whore’s hands be offered to God? That night the King received a dream to bring Karama and apologise to her for what had happened. All she said was that Jagannatha was beyond notions of pure and impure. She was told to cook again. When she did she could see two young boys gazing at her from the corner of the street. She gave them some of it out of motherly love when they asked for the prasada. When the food was taken to the temple, someone noticed a grain of rice stuck to Jagannatha’s lips. The offering was made. Now the priest saw him in his palm. The God was satisfied. Some others Karma think was born in the Nagaur district of Rajasthan, sometime in the 1600s. This is clearly another lady, but the story is somewhat similar. The earlier Karama’s is the better-known story, since the 16th-century poetess Madhabi Dasa mentions her name in one of her jananas to Jagannatha. Of course she wouldn’t have written about somebody living in her times. Anyways, here goes. Hers was a Jat family. Once, her father instructed her to offer food to Krishna since he was too busy. The young Karama took the statement literally. She woke up early the next morning and making some khichdi, offered it to Krishna. When she saw that Krishna was not eating anything, she felt bad — she herself did not eat until he would. It is said that Krishna then appeared and ate the khichdi. Her father was shocked at the incident, and Krishna appeared again to prove her true. Karama took a living samadhi at the end. The offering of Karama’s Khichdi was a great thing back then, and is even now, for food prepared outside the temple had never been offered before. Her recipe was introduced into the Temple Kitchen nonetheless. The earthen pot in which Karama Bai cooked became known as the Bai Handi. The new prasada came to be called Karama Khechudi or Mahadei Paka. The practice continues till today.